One side of my memory is full of the fabulous position of Beveridge Reef. A remote and stunningly beautiful coral atoll surrounded by pounding South Pacific waves and the incredible flat - calm anchorage within the lagoon. 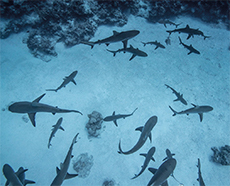 Combined with the excitement and joy of diving the shark - rich waters of the lagoon passage this proved to be an idyllic target on our National Geographic Pristine Seas expedition to Niue. We joined large groups of sharks on all of our dives and were always accompanied by whale song. This is truly world class diving!